France has a variety of goat breeds: from the Alps, Alpine -- which is the most common and represented in France -- and Saanen -- beautiful white goats from near the Swiss border; Poitevine -- black and found more in the west, Poitou region; Corse -- raised originally for meat; Pyrénées -- shaggy black and brown; Rove -- brownish from the Bouches-des-Rhones on Mediterranean coast, used for Picodon and Banon; Des Fosses -- gorgeous white and gray shaggy, live near the Channel, in Normandy and Brittany (in small amounts, as this normally is cow country); Massif Central -- black and white shaggy; and Provençale -- gray and white shaggy from Provence, and used in making Banon also. There are two farmers on the edge of the Marilhou river, by Trizac who have 50 goats that they milk from March to October. 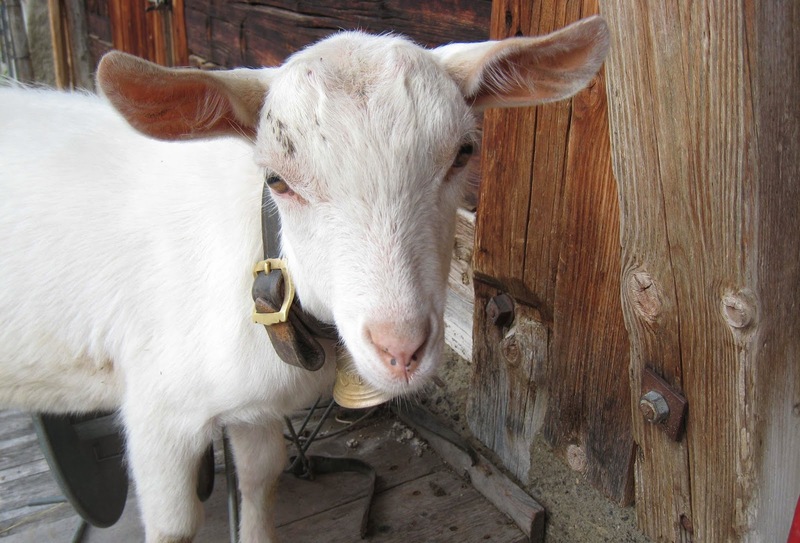 I am told by Monsieur Laurent Dubois himself -- one of the great cheesemongers of Paris (and, therefore, of the world) -- that they treat the goats like their own kids, if you'll pardon the pun. The goats live attached to the house in a barn that I'm told is much more modern than the home. Or rather, the barn and area for milking and cheesemaking has long been electrified, sanitized, and modernized, whereas the home only recently got electricity. Literally. But the days for this level of care for the goats, and the quality of the resulting cheese, may be numbered. You know that old stereotype of how goats will eat anything? Well, evidently, they really will. So the goatherders have to actually follow the goats around for hours and hours on end to watch what they eat -- carefully steering them towards good herbs and plants that will delicately flavor their milk. Wow. Never before has research yielded so little information. If you google images for "Tommette du Marilhou", you will get exactly three choices: cartoon butterflies, cartoon umbrella, or cartoon of a horse pulling a cart with the words "H.J.Heinz Co." above it. Perhaps when you google it now that I've published this posting, you will also see my picture. Who knows? There's not much more information in a regular google search, frankly, and none in any printed information. So I need to go to the store itself. It's a raw goat's milk cheese from the Trizac region, on the edge of the Marilhou river, and it's very thick, with a texture between creamy and crumbly. The taste is herby, grassy, earthy, and quite lovely. Laurent Dubois claims it is one his personal favorite goat cheeses, so that's really saying something. It's a fermier cheese -- meaning the cheese is made with milk only from the goats on this farm. The cheese is aged 4-6 weeks at least, but it ages well. The last of it is sold in the store around four months later, not to be seen again till the next distant batch. And you'll only see it in a few stores in the first place -- basically the most elite cheese sellers in Paris: Laurent Dubois and Quatrehomme, for example. Laurent Dubois says that he usually takes only one or two cheeses from each farm and producer, in order to get the best only from each of them. But in this particular case, he'll take everything the farm has to offer, since all of it is the crème de la crème (goat crème, as it were). On a completely unrelated note: curious about the expression "getting your goat"? It refers to the practice of stabling goats with horses to keep the horses calm. When somebody gets your goat, your horse gets all agitated (and, I guess, so do you).